A beautiful Purdey double rifle. But what do you do with it? There’s a list of things I like to see when I look at doubles. This James Purdey double rifle checks all my boxes: It’s vintage; it’s gorgeous; it’s by a famous maker, it’s top quality; it’s in great orginal condition; and it’s cased and comes with most, if not all, its original accessories. Unfortunately, other than stare at it, I have no idea what I would do with it. Why? Because of its only flaw: It’s a 28-bore rifle. 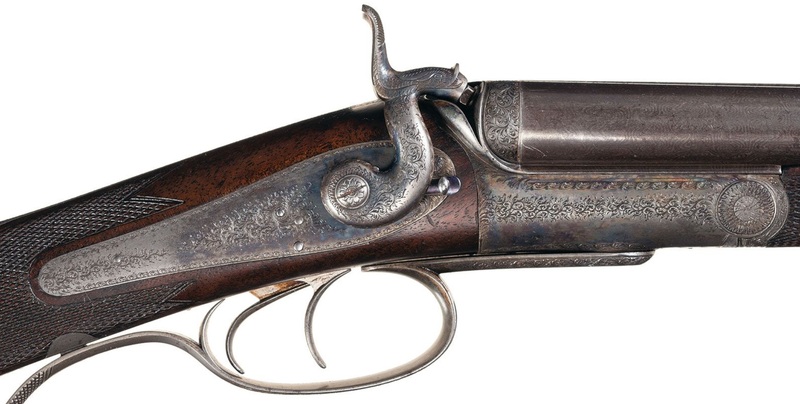 This means it has rifled barrels, but shoots a 28g shell (probably 2 1/2″) loaded with a lead slug. While this load would be fine for whitetails, getting the ammo would be a PITA. Even if you could get it or wanted to do through the trouble or loading up your own, getting the rifle to regulate and shoot right could be just a difficult. A .450 BPE like this is more practical and, in a most ways, just plain better. Lot 535: Rare, Very Fine Cased Engraved J. Purdey 28 Bore Back Action Rotary Underlever Hammer Double Rifle with Accessories: The makers have kindly confirmed that this rifle was completed on October 2nd 1867 for Viscount Downe of the 2nd Lite Guards, as a center fire double hammer rifle in 28 bore with 30 inch Damascus barrels. Only 327 hammer double rifles were manufactured by Purdey in 1880-1900 per page 200 of “Purdey: Gun & Rifle Makers, The Definitive History” by Dallas. A rather similarly laid out pinfire double rifle is pictured in plate 36. The rifle has the matching serial number on the bottom of the barrels, the forearm hardware, and the lever. The barrel rib has a bead blade front sight and four leaf rear sight (three folding leaves) with platinum sight lines and is signed “J. PURDEY 314 1/2 OXFORD STREET LONDON” on top ahead of the rear sight. The barrel flats have standard London black powder proof marks, and the water table has London view marks. The non-rebounding floating back action locks are signed “PURDEY” in small letters, and “PATENT” is marked on the upper tang. The checkered buttplate is marked “CHARGE/3 DMS No. 6 POWDER” at the heel. The action, locks, and furniture have fine English scrollwork engraving. The action has carved percussion fences, the pistol grip trigger guard acts as the rotary underlever, and the locks each have blued sliding safety catches. The well figured stock and forearm are checkered, and the length of pull is 14 3/8 inches. The initial escutcheon on the bottom of the buttstock is inscribed with a coronet and monogram. It comes in a factory oak case with a trade label with hand marked loading information and a second handwritten label indicating where powder could be purchased in Calcutta and Bombay indicating this rifle was likely taken to India at some point. The case contains a variety of equipment for loading and maintenance. Condition: Very fine with 90% brown finish and distinct Damascus twist patterns along the barrel group which has some soft spots and small patches of minor surface oxidation, 75% plus original case colors with particularly vibrant colors in the protected areas, some mottled patina, and crisp engraving and marking; remnants of original bright blue finish on the heel of the buttplate and gray and brown patina on the balance, and general minor marks and scratches throughout. The wood is also very fine and has crisp checkering, some minor edge wear (including some small chips on the forearm), light pressure marks and scratches, and smooth oiled finish. Mechanically excellent. The case and accessories are fine with mild storage wear. It is nice looking time capsule. The gun’s low estimate is interesting. Do you have any comparables to compare with the estimate. Not everything is practical in gun collecting! No, no comps I’m aware of. Most bore rifles are in the 12g+ range — 10g, 8g, 4g. The best comp is probably a Purdey .450 BPE hammer rifle. In similar condition, one of those is worth around $15,000 or so. But because of it’s ammo situation, this gun is basically obsolete. I would MUCH rather have the .450 rifle — easy to get ammo for or reload.